Repeat this a few times, and then finally someone will suggest a place to go, or something around the house to work on together. Today it was so lovely outside, in spite of the snow that arrived during the night. The temperature was getting above freezing. We were itchin’ to get out and take a drive. 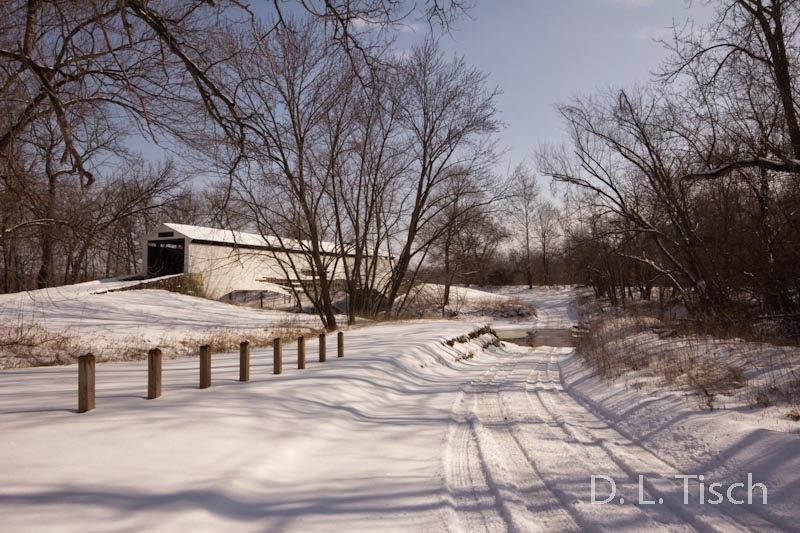 A few miles from us is a covered bridge, and that is where we chose to go. Union Bridge, near Paris, Missouri, was built in 1871. You can read a bit about it here. It is in need of some repair, but walking through it you can still get a sense of the craftsmanship that went into making it. I was fascinated by the stonework that forms the road leading up to it. Mark appreciated the post and beam construction, and the wooden pegs holding it together. Walking through it on these boards gave me a sense of history, making me wonder how many people used this in times past. An amazing structure. Mark read that it was made so that a hay wagon could get through. It was picture perfect. Peaceful, just warm enough, and the sound of the water flowing over the rocks in the creek made it so calming. Mark is standing (lower left) on a concrete roadway that can be driven over when the water is not too deep. A destination + my camera + my best friend = a perfect winter day exploration. Beautiful photos of a beautiful day, Deb! I love the curved beams on the sides. Wonderful old bridge! Looks like a wonderful day together! What a wonderful exploration! I marvel over the construction of old covered bridges. I love the way that beam is spliced and held together with pegs. I hope someone will repair the missing siding before it deteriorates further. This is a lovely spot on a wintry afternoon. I hope you'll bring us back with you again in other seasons! A perfect winter day. What a beautiful structure. I agree with Lee – this is definitely a place to re-visit in each of the seasons. It looks like a wonderful outing! How lucky you are to have such a beautiful area nearby to explore — the bridge, which you photographed so well, is a treasure. A glittering white day for a drive! Those old covered bridges are so charming. I'm sorry t see people felt the need to leave their names and graffiti.